The Paris Climate Agreement: A Good Deal for the United States. An Essential Deal for the Planet. Update: Mar. 27, 2019 Members of the House of Representatives introduce H.R. 9, legislation to keep the United States in the Paris Climate Agreement and ensure the U.S. honors its commitments to tackle climate change, alongside the other nearly 200 nations that signed the agreement. “The climate is changing on Capitol Hill,” said Martin Hayden, VP of Policy and Legislation at Earthjustice. “And this time, it’s for the better.” Read more. For the first time in history, the Paris Agreement brought all nations—developed and developing, and including China and India—together to fight the climate crisis. U.S. leadership was critical in getting us there. Instead of questioning our leadership and involvement, Mr. Trump should help our country do more to reduce greenhouse gas emissions and to accelerate the clean energy transition. Make your voice heard. The Paris Agreement is a tool to bring clean energy jobs to America, foster U.S. global leadership, and keep our planet livable. 1. What does the Paris Agreement do? The Paris Agreement came into force on November 4, 2016, and committed 197 nations to an aspirational goal of holding global temperature rise to “well below 2 degrees Celsius above pre-industrial levels” and cutting net greenhouse gas emissions to zero in the second half of this century. 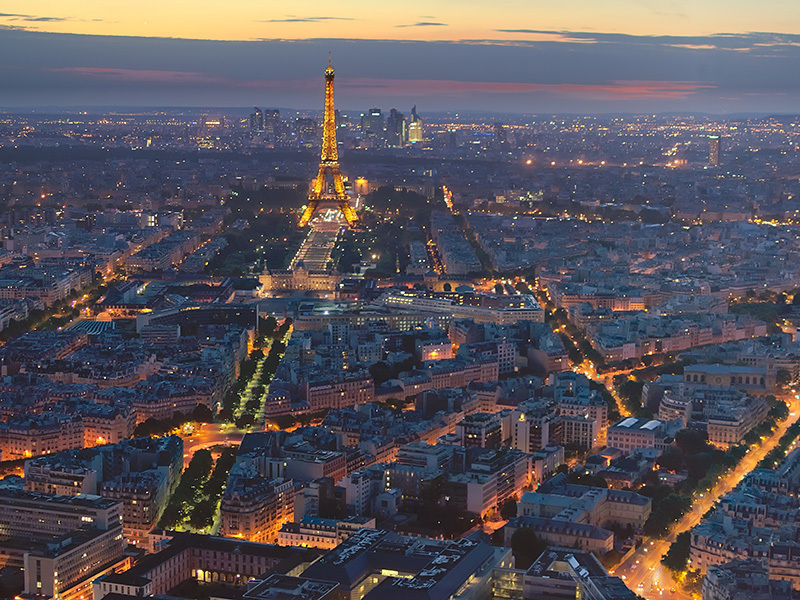 The U.S. negotiated hard in Paris, winning strong transparency and accountability measures to ensure that China and India do their fair share. It included the ability for every country—including the U.S.—to set its own non-binding emissions reduction targets, known as Nationally Determined Contributions. The U.S. target is to reduce greenhouse gas emissions 26–28 percent below 2005 levels by 2025. It is achievable and will drive economic growth. These reductions will also give Americans cleaner air, a livable planet for our children, and, in many cases, cheaper electricity. The legally binding parts of the Paris Agreement are few and procedural, and are aimed at giving the public and other governments a way to know whether China, India and others are following through on their commitments. These obligations mostly re-state existing obligations from the UN Framework Convention on Climate Change (UNFCCC). The Agreement does not create new financial obligations for the U.S. 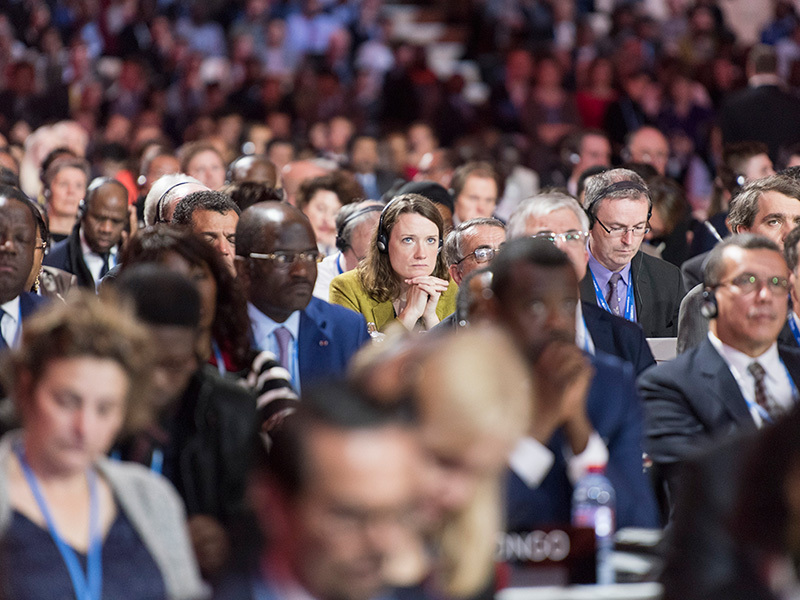 The closing ceremony of the UN Climate Change Conference in Paris, December 12, 2015. Fundamentally, the Agreement delivers a powerful signal to business, investors and communities that the nations of the world are committed to curbing emissions and accelerating the transition to a low-carbon, cleaner energy economy. And, it is a clarion call to capital markets to re-assess their bets on fossil fuels, move beyond short-term returns, and embrace the biggest investment opportunity of the century: renewable energy. 2. Can President Trump “cancel” the Paris Agreement? No matter what Trump does, the Paris Agreement remains in force. There is extraordinary global political will behind the Paris Agreement, which no single nation can undermine. World leaders and mayors, governors, business and community leaders across the U.S. have made it very clear: Implementation of the Paris Agreement will move forward, with or without the formal participation of the Trump administration. American mayors have pledged climate leadership and to move forward with clean energy with or without the Trump administration. Governors are urging Trump to stay in the Paris Agreement. Two hundred institutional investors managing over $15 trillion in assets have been clear that the U.S. and other G7 nations should implement their Paris Agreement commitments to drive trillions of dollars in new clean energy investments. And big business, from BP and Shell, to General Mills and Walmart, wants the U.S. to implement the deal to build a more resilient economy and move toward a cleaner energy future—it’s what their customers want. 3. Can Trump withdraw the U.S. from the Paris Agreement? Any move by Trump to withdraw from the Paris Agreement, other than by its terms, would be a violation of international law. The withdrawal clause of the Paris Agreement (Article 28.1) permits any country to voluntarily withdraw three years after it enters into force for that country, with withdrawal taking effect at least one year later (Art. 28.2). Any move by Trump to withdraw from the Paris Agreement, other than by its terms, would be a violation of international law and would gravely undermine the rest of the world’s trust in the U.S. as a negotiating partner, incurring major diplomatic blowback that would hinder cooperation on multiple strategic issues, such as security and trade. 4. Is Senate advice and consent required for the Paris Agreement? President Obama correctly joined the U.S. to the Paris Agreement by “executive agreement.” The U.S. most often joins international agreements by executive agreement, not by signing treaties requiring advice and consent of the Senate. The Supreme Court has consistently recognized the authority of presidents to conclude international agreements without Senate consent when the agreement falls under the president’s own constitutional authority or authority derived from prior Congressional action. The Paris Agreement doesn’t create any legally binding emissions reduction obligations for the U.S. The president had ample authority to enter into the agreement based on the Senate’s approval of the UN Framework Convention on Climate Change in 1992 and on the statutory authority to protect Americans' health and our environment found in bedrock U.S. clean air and other environmental laws. And nearly all of the Agreement’s procedural requirements to provide information can be implemented under the president’s constitutional authority. If Trump tries to falsely assert that the Paris Agreement is really a treaty that must be referred to the Senate for advice and consent, he risks curtailing his—and all future presidents’—ability to enter into international agreements going forward, and cast serious doubts about the trustworthiness of the U.S. as a negotiating partner. 5. Can Trump withdraw from the UNFCCC, simultaneously effecting withdrawal from the Paris Agreement? The United Nations Framework Convention on Climate Change (UNFCCC) was ratified by George H.W. Bush in 1992 and has been the foundation of global cooperation on climate by Republican and Democratic administrations alike. Withdrawing would forfeit the U.S.’s seat at the table and our influence in critical decisions that shape the future of the global energy system—the biggest infrastructure investment opportunity of the 21st century. The Paris Agreement provides that any nation that withdraws from the UNFCCC is considered to have withdrawn from the Agreement. The UNFCCC withdrawal clause (Article 25) stipulates that withdrawal takes effect one year after the country notifies its intent, which Trump could do immediately. 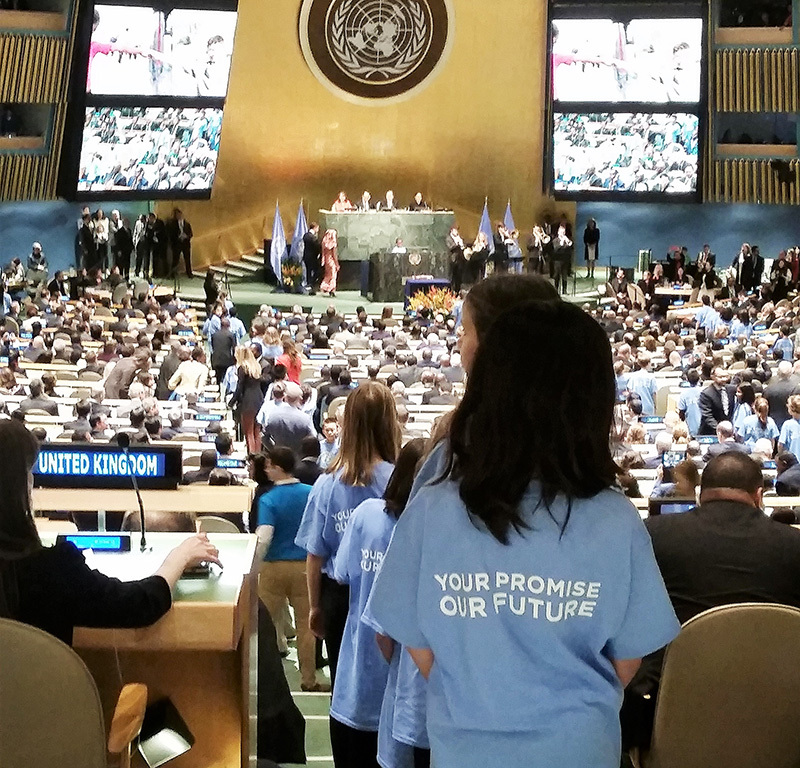 Schoolchildren, all wearing shirts bearing the words: “Your Promise, Our Future,” streamed down the aisles at the close of the Paris Agreement signing ceremony at the UN General Assembly in New York, April 22, 2016. 6. Practically, what will happen if Trump withdraws the U.S. from the Paris Agreement? With or without the U.S., the rest of the world will implement the Paris Agreement. With or without the United States, the rest of the world will implement the Paris Agreement. Other nations’ leaders aren’t wasting time denying climate change; in fact, they are moving forward to reap the economic and health benefits of the clean energy economy. The European Union, China and Canada have all stated that they will work to take up the slack left by the United States on clean energy financing and cutting greenhouse gases. And China recently announced plans to invest $360 billion in renewable power sources like solar and wind by 2020. At home, American cities, states and forward-thinking businesses—recognizing the need for cheaper, cleaner power, faster job growth and clean air—will pick up the slack in cutting greenhouse gas emissions and investing in renewables. Even ExxonMobil and General Electric say they support the Paris Agreement and efforts to slash greenhouse gases. Technicians install solar panels on a home in Spokane, Washington. The solar energy industry is creating jobs 17 times faster than the rest of the U.S. economy. 7. Does the Paris Agreement create binding domestic law? The Agreement is not “self-executing,” meaning that it is expressly not intended to create binding domestic law. It does not create a private cause of action in U.S. courts and, unfortunately, cannot be used in lawsuits to stop the Trump administration's attempts to roll back the Clean Power Plan. 8. What can I do to defend U.S. international climate leadership? Now is the time to speak out—Americans will not turn our backs on climate leadership. The United States should be a country that leads on the big challenges. By withdrawing the U.S. from the Agreement, Trump is handing global leadership and clean energy jobs to China. The majority of registered voters—7 in 10—support participating in the international Paris Agreement. America should be accelerating the transition to clean energy and reaping the job benefits of one of the fastest-growing sectors of the economy. Wind and solar costs have plummeted, making them a go-to replacement for shuttered coal plants. They make up more than half of the new capacity added to U.S. power grids in the past two years, because it made economic sense. Nationally, new clean energy jobs outnumber fossil fuel jobs by more than 2.5 to 1. In 2016, the solar industry employed many more Americans than coal, while wind power topped 100,000 jobs. 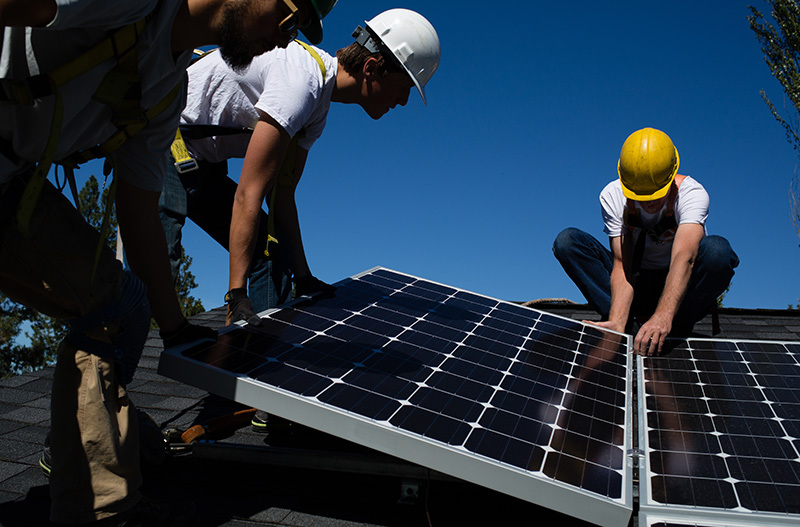 The solar energy industry is creating jobs 17 times faster than the rest of the U.S. economy. About the Author Erika Rosenthal is a staff attorney with the International Program at Earthjustice. Her work focuses on climate change, at international negotiations, and with UN Environment Programme and regional bodies like the Arctic Council to reduce emissions of atmospheric pollutants such as black carbon and ozone.